Morocco is a popular destination for travelers looking to get off the beaten path. With their never-ending winding streets, narrow passageways of the medinas and the famed exotic smells of the markets wafting through its most popular cities such as Fez and Marrakesh, Morocco can be magical. However, if you’re really looking to connect with this vibrant community, there is much more to see outside of the bustling cities. 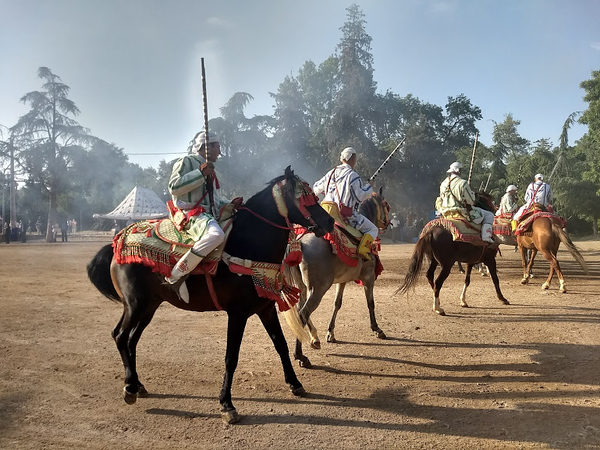 Today, Bethan Owen, who spent just over two years living in the Middle Atlas region of Morocco, is here to share with us how to go off the beaten path in Morocco. Visitors to Morocco will come back with tales of the towers of spices and piles of woven rugs in the maze-like old medinas, the donkeys winding their way through the packed streets, and the wild taxi rides of the city. For some variety, you might hear about camel rides in the desert. Moroccan cities are always exciting, and visiting the desert is a bucket list item that shouldn’t be forgotten. However, many travelers never see what else Morocco has to offer. Just one of the sites you’ll see while driving between Morocco’s smaller towns. Outside of its cities and desert destinations, Morocco is full of towns and villages that have their own unique charms but are rarely seen. One of these places, well-known by locals as a beautiful little mountain town, is Imouzzer du Kandar. 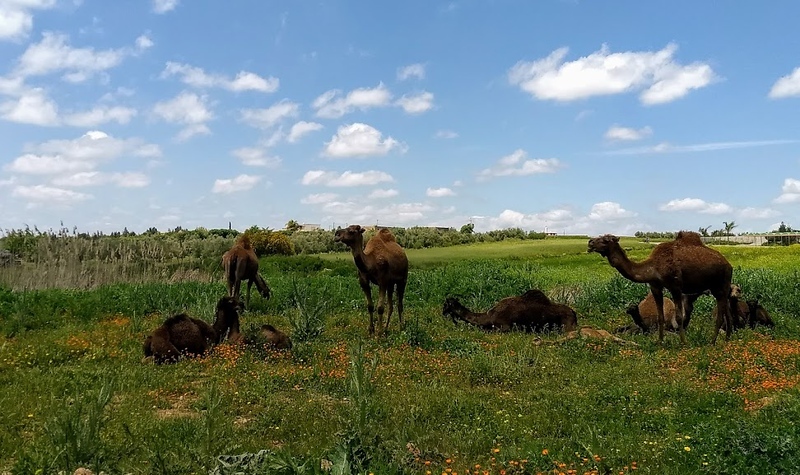 If you want to try something a little off the beaten path, where you can experience Morocco without feeling like a tourist in a mass of other tourists, visit Imouzzer du Kandar, or Imouzzer for short. Your journey starts in Fez. If you’re without a driver it is relatively easy (and cheap) to use public transportation. While the colorful petite taxis are meant to shuttle people around inside the city itself, the petite taxi’s older brother, the grand taxi, is designed to carry people in between towns. If you flag down a petite taxi and ask the driver to take you to the Imouzzer Kandar taxi stand, you’ll soon be on your way. From Fez, the taxi to Imouzzer should only cost $1.60 per person, although you’ll be sharing your ride with six other people. It might be a new car with comfortable seating or it might be an old Mercedes that seats three in front and four in back, but it will get you where you need to go, as soon as the driver has filled every seat in his car. If you don’t feel like sharing, many taxi drivers are willing to let you rent out their entire car—although you will have to pay the cost of the trip for each empty seat. You’ll know you’re getting close as your taxi starts to slowly climb higher and higher into the mountains. The trees will start getting denser, and you’ll pass through hilly terrain with red dirt and fruit groves pressed up close against the road. You will drive past a few scattered houses, and you may see shepherds walking along the road with their sheep, or women leading donkeys. In the summer it is cool, and in the winter, it snows. Immouzer Kandar is different from many Moroccan towns in that respect. It has an Alpine feel that isn’t present in many other places in Morocco, from the plentiful trees to the snow to the slanted roofs. Fantasia riders at a festival in Imouzzer Kandar. Although Imouzzer Kandar does not have as much to do, or as many historical sights, as the major cities in Morocco, it may just become the most memorable part of your trip to Morocco. 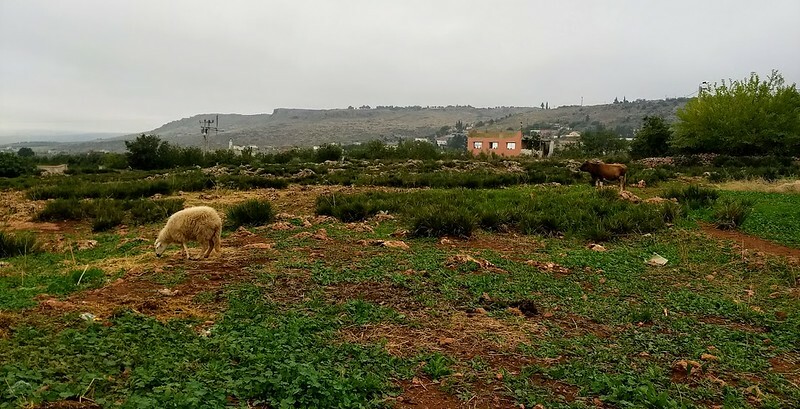 Visiting this rural area will give you a much better understanding of how Moroccans live, and it can serve as the perfect break from the chaos of the crowds you will find elsewhere. Imouzzer has several well-kept parks, which can be rare in Morocco, and a spring that runs through the town. The spring water there is actually bottled and sold across the country—look for the Ain Sultan brand when you’re out shopping. You won’t find any merchants grabbing your arm or taxi drivers trying to pull you into their car. Instead, you can walk through the local market or visit an authentic hammam, if you’re feeling brave. For an even better insider experience, arrive knowing a local, or planning to meet up with someone. Moroccans are known for their hospitality, and you may be surprised by the people who want to speak with you or ask you to join them for tea. If meeting strangers isn’t your thing, you can contact Greensides Development Foundation, a local organization that is working to improve Imouzzer and the villages around it, partly through cultural exchanges. Depending on availability, Greensides can offer tours, plenty of introductions to locals, and even places to stay. Beyond its own charms, the towns and villages around Imouzzer are worth visiting on their own merit. From Imouzzer, it’s just a short taxi ride to a number of other places, including Azrou, where you can get up close and personal with Barbary apes, the little village of Ait Sbaa with its popular summer swimming pool and picnic spot, or enjoy the nationally renowned cherry festival in Sefrou, a UNESCO World Cultral event. Get a taste of rural life when traveling outside of Morocco. 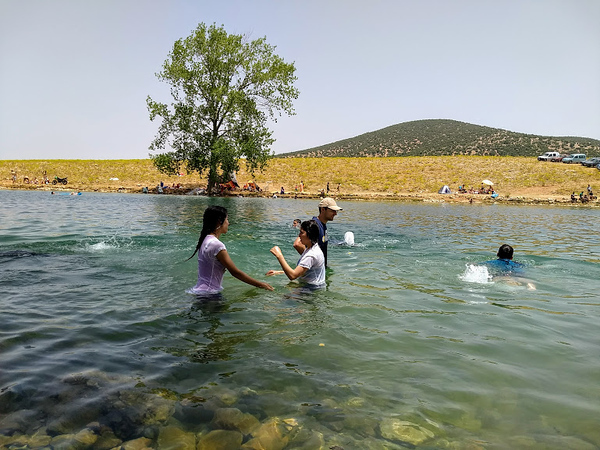 We took this shot of people swimming in a small lake when we visited Ifran. Depending on the timing, you also might be able to see the apple festival in Imouzzer du Kandar, or a traveling fantasia. If your trip doesn’t coincide with a big festival or planned event, don’t worry. It’s still worth your time to visit. Instead of preparing for a big event, visit these places to get a feel for what life is like there. This is the quaint village of Ait Sbaa. Getting out of the city lets you enjoy the slow country life. Looking for a place to stay in Morocco? Start your search for hotels in Marrakesh with us! Visit the local markets and stop in the café for a coffee (a very popular Moroccan activity. Traditionally, this is a man’s activity. Women might expect some staring). Try to strike up a conversation with one of the students you’ll pass on the street. Many of them will be studying English, and might give you some insight into Moroccan life. Buy something from a little corner store, or visit a park. Take a day to spend some time in a Moroccan village and see what life is like outside the pictures you see on the postcards. Bethan has spent just over two years living in the Middle Atlas region of Morocco, where she has been honing her writing and travel practices, as well as her relationships with the local stray cats.